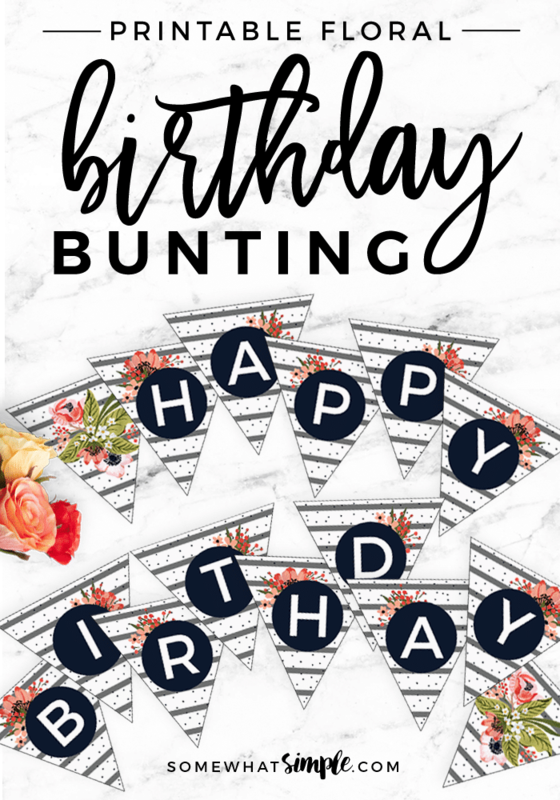 This gorgeous floral birthday banner is perfect for those special ladies in your life who need to be celebrated on their birthday! Who said birthday banners are just for kids?! We love how simple and gorgeous our Floral Birthday Bunting turned out, so naturally, we’re sharing it with you! Have a daughter who’s too old for My Little Pony? Have a sister who needs to know how special she is? A coworker who’s a little more Audrey Hepburn, and a little less Minnie Mouse? Then we’ve got the starting point for an awesome birthday this year! 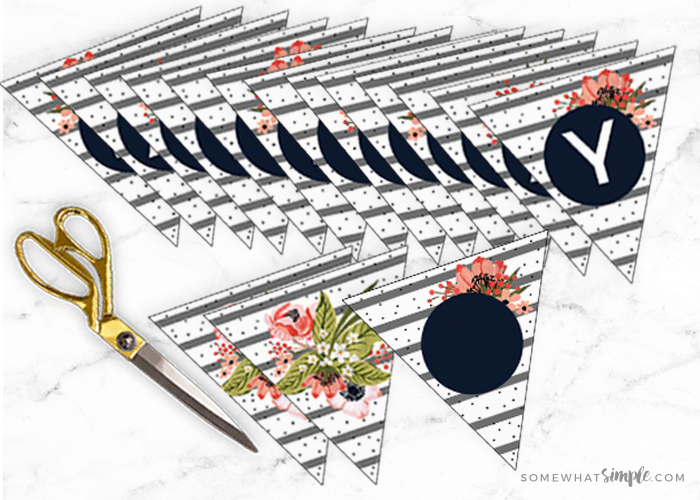 First, print of our beautiful Floral Birthday Bunting, and cut out each triangle. Another option would be to sew each triangle onto your ribbon to make it a little bit more sturdier. 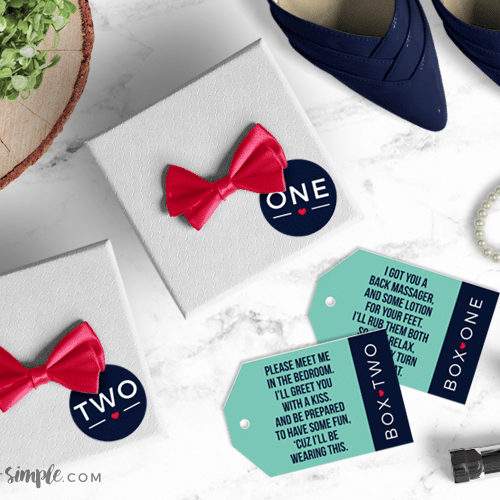 You could also shrink the files down, and now you have a gorgeous birthday cake topper! Just drape it between 2 kabob sticks! 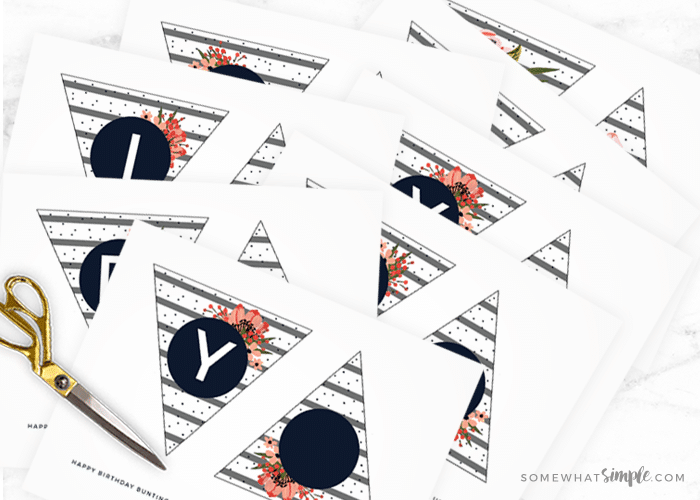 This kit is 8 colorful pages that include: 2 plain floral + stripes triangles, the letters HAPPY BIRTHDAY on their own individual triangles, and then one plain triangle so you can fill in your own number, letters, etc. Just print off as many as you need! 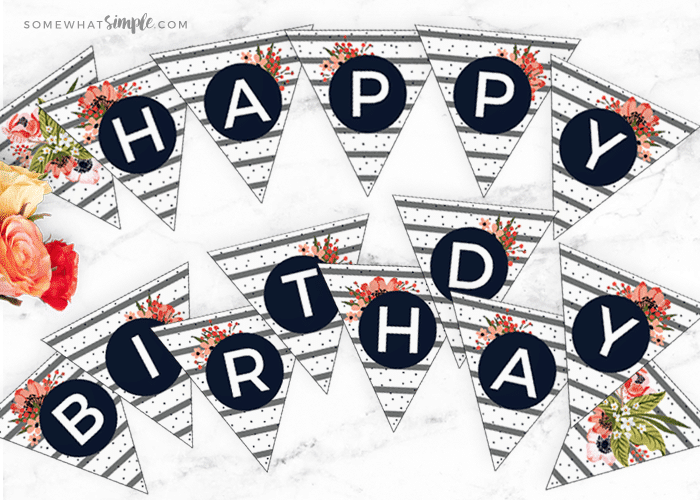 CLICK HERE to download our Floral Birthday Banner! 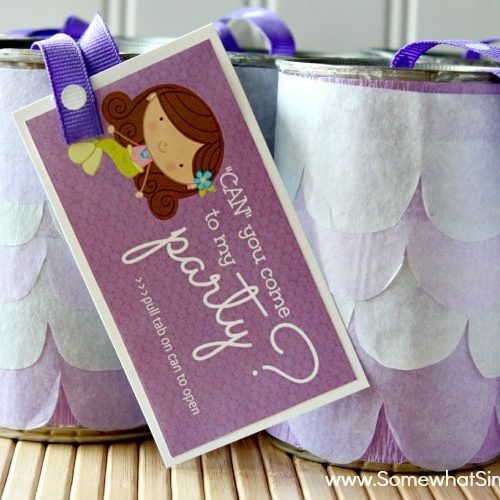 This post originally published in December 2009, but was updated with a new printable and images in 2017. LOVE this and had to make a Valentine's one. Linked back to you- thanks for the inspiration. Each flag is about 6 inches wide (at the top) and 11 inches long. Quick question…can you give me a rough measurement of a flag? I'm new at this and not sure how much material to buy. I am famous for over-buying!!! Thank you! Love the idea! I've been seeing these everywhere and didn't realize they were so easy. Thanks for the tutorial! I don't have a sewing machine, so I imagine I could use more fusible web to attach the triangles to the bias tape? that is a great banner! Thanks so much for the fun tutorial! 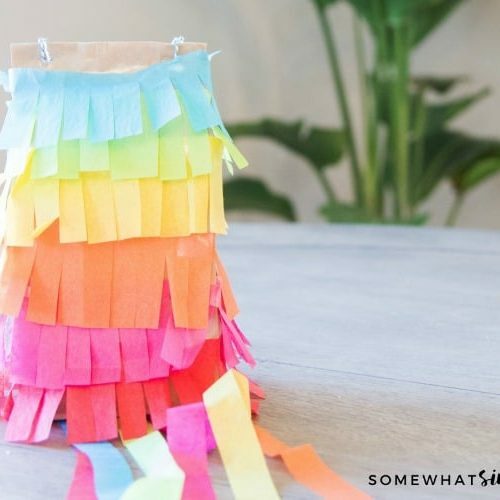 I have been wanting to make one of these and now I think I can! Have a Merry Christmas! !